We are trying to raise an average of $1 for every Dream League player James probably scorekept for in the past 1-2 years, or about $500 in total. $4,500 remains on the cemetery bill. There are also costs with relocating the family out of the Sunnydale projects. Please help Dream League help the Love family in honoring James. See current updates and thank yous below. Total Raised Last Updated: 1/16 8:00AM PST. Note: The transaction fee incurred by Dream League is 2.9% plus $0.30; to donate $1.00 to the Love family, the gross total is $1.34. Donations made by check or cash may be mailed to: Love Family c/o Dream League, 1512 19th Street, San Francisco, CA 94107. SAN FRANCISCO, CA — This is by far the most difficult story I’ve ever had to write. Where do I begin? Begin at the beginning, as the saying goes. Alright, I’ll begin at the “beginning” and work my way backwards. You’ll see what I mean. It must have been harder for Mike since James had worked in the Beacon’s program since he was twelve and a student at Visitacion Valley Middle School where the Beacon is located. I immediately called Mike, but he didn’t have any details. A few days later, James’s older brother Ibyn would call — good thing he still had my number on his cellphone. Ibyn explained that James got called out from his apartment and got involved in a fistfight. James was winning the fight and started to walk away. That’s when the gun shots rang out. Plural. It wasn’t even one shot. James didn’t have a chance. I just hope he didn’t suffer too much. I’ll probably never know. This was a classic example. They’re going to call this “gang” violence. James wasn’t in a gang and wasn’t involved in drugs. He tried his best to stay away from it. Whether or not the murderer was in a gang is almost irrelevant (unless the gun was obtained through a gang or something). This was two or more teenagers dealing with conflict. In the projects, you better realize that conflict can end with, literally, a bang. But I think James knew that. So it was the peer pressure. You and I have been there before. Remember in high school when that bully just wouldn’t leave you alone? We’re talking Lord of Flies stuff here. There’s peer pressure to act. James could have decided not to come outside, but he succumbed to the peer pressure that we all have known growing up, except when we grew up, getting beat up was a statistical probability, while getting killed was a statistical impossibility. With the desperation in the projects these days, getting killed is more like a statistical probability. It’s almost unbelievable that it has come down to this. It had been only Thursday — the day before! — when James had phoned me out of the blue. “I can’t wait to get back to working in Dream League,” he said, “I’m looking forward to it and I appreciate all that you’ve helped me with.” I would later find out at the funeral that James shared his appreciation for his friends and mentors at various times in his life. It’s pretty amazing he was able to tell so many people he appreciated them before he passed. James and I had been through it all in terms of mentorship and employment. The last time I had talked to him was before he left for his annual summer job at a youth camp. Right before that, we had argued about his work performance. We had reached a valley in our tenure of peaks and valleys. I had to fire him for not performing up to par, showing up late to work on a couple of occasions, and acting in insubordination. Many frustrating circumstances resulted from his constant lack of stuff we take for granted, such as, well, food. One time he showed up late for a Dream League assignment (a violation of Rule #1) and was so hungry, we had to order a mini-pizza delivered from Goat Hill, which was no more than 3 blocks away, because games were going on and there was no way anyone could walk over there. The pizza cost about $8 and the delivery tacked on $2. I took it out of his pay because I was not happy he was late to begin with (again), which left our operations somewhat crippled. Trying to show him who was boss and who was employee, I scolded him (again) about first being on time before anything else, but he argued back with excuses. So you can see that there were other things going on in his life that affected his participation in the Dream League program. James had done it all. From operating the scoreboard at Dream League games, to meeting me up at the Visitacion computer lab to inputting stats on our website, to learning how to tally stats while operating the scoreboard — this qualifies as “multi-tasking” in corporate-speak — to learning how to operate the shotclock, to videotaping game play. To this day, he did more than any other youth worker has done while with Dream League (EJ is a close second). Imagine that, a kid from the projects who is attending a high school for kids who have dropped out of regular high school (Downtown High School in SF). A kid with a learning disability and who has trouble understanding just what school is supposed to mean to his life. A kid who has to worry about getting hit by a stray bullet while walking home — believe me, there is not one reason to feel safe while dropping James off by his apartment. Here he is, logging in with a password to a website, accessing an online database, moving data from one location to another, and ensuring data integrity! The kid for which the only thing that made sense was basketball. James was everything Dream League was and is meant to be. According to our records, James scorekept at least 150 Asian American league games over the course of almost two years. He probably inputted as staggering an amount of game stats on our website as well. Then there were the Open League Top Gun games at Visitacion Valley, St. Mary’s Rec Center, and Enola D. Maxwell Middle School. I couldn’t find any records for those, but that had to be about 50 games all told. If you played in Dream League anytime over the past 1-2 years, with an average of 11 games played per team per season, I’d say there’s about a 20- to 25-percent chance James scorekept one of your games. There’s a 50-percent chance he entered your stats onto the website. Maybe a 1-percent chance he videotaped your game, since we don’t do that as much. James and Ibyn at their favorite pasttime: a Warriors game, of course! And now he’s gone forever. This is a major loss for Dream League and Dream Leaguers alike. All that we did, it wasn’t for nothing, right? James was the model Dream League kid. He even came by my house on several occasions to input stats if the Visitacion computer lab was closed. He even watched my baby daughter a couple times while I had to use the bathroom or whatever. He even slept over one night. He was in the passenger seat when my car hit a pothole on 101 coming home from San Mateo games. They sent the wrong stupid tow truck and we waited two long hours that chilly Sunday evening. We compiled the days’ stats with a flashlight and the rear dome light on. James was the quintissential trooper. He even tagged along on my crazy gym-hopping schedule for a good stretch, when we’d hit up Potrero, San Mateo High, then trek to Ira Jinkins Recreation Center in Oakland, all in one Sunday. Afterwards, we’d grab a quick bite at the drivethru at Taco Bell or Burger King, then I’d drop him off at Coliseum BART and he’d be off late into the night to Ibyn’s place in Pittsburg. Keep in mind, BARTing to Pittsburg is not cheap, even at youth ticket rates. This kid knew it was dangerous to go back to Sunnydale. He didn’t want to get mixed up with the wrong crowds. He often compiled stats while riding back home on BART. James had a copy of Hooked, the story about Hook Mitchell. He got it at the Wherehouse. He didn’t know about Hook too well either, but thought it might be cool to watch his DVD. So he forked out ten bucks for it. He let me borrow the DVD. I checked it out and was extremely intrigued. It wouldn’t be a far stretch to say that if there were a Dream League near Hook when Hook was growing up, maybe Hook doesn’t end up in jail? Well, that’s the dream of Dream League, I must admit. “C’mon, Rich, you’ve seen my neighborhood,” he replied matter-of-factly, with his trademark smile that he used for keeping things on an even keel. I knew it was a painfully obvious question that really didn’t need James’s answer. About a month later, I was trying to promote our Year of the Yao screening by all means necessary. I came up with the “brilliant” idea of printing up lowest-cost glossy flyers (5,000 for about $125) that they use for promoting nightclubs, and passing them out and putting them on as many cars at the Coliseum as possible on a night the Warriors were playing. It just so happened to be the last game of the season. EJ and Carlos couldn’t make it, but naturally James had no problem working the hours and perhaps getting a free bite to eat afterwards. Dream Leaguer Ken Wan joined us for the first hour. Ken traversed to a different part of the lot, while James and I set up camp at the pedestrian bridge from BART to the Arena, a major thoroughfare before the game. James was great at passing flyers out and had no issues. He’d be able to relate to many others and get them interested in what the heck our event was about. One interesting thing is, some people really don’t give a damn about Yao Ming. They couldn’t care less about this guy who has the 1 billion population of China rooting for him. And some Chinese people dissed us. I was very disappointed by that, being full-blooded Chinese. Shame on them! James and I distributed about 2,000 of these. 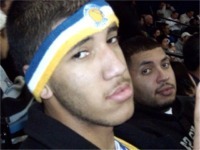 Then at one point, still before tipoff, James said, “Hey Rich, guess who this is? !” There James was, standing right next to Hook Mitchell! I explained to Hook who I was and he acknowledged receipt of the letter I sent him about the Yao event. I got his phone number and would later meet with Hook on a few occasions to talk about ways our businesses could work together. If it weren’t for James Love, I would have never heard of Hook, I would have never met Hook. Just on this example alone, I swear James would have become a great salesman or business developer. He was a master at breaking the ice. Don’t worry, eventually James got his own copy of the DVD. I bought one off Hook at our first meeting at Club One and had him autograph it especially for James. Matter of fact, I was supposed to meet Hook through an arrangement from Paul Bates, the director at Ira Jinkins. The new semi-pro Oakland basketball team had just been formed and Paul was trying to get the owner to invite Hook to tryout. So I invited James to come along and see if we could meet him. James and I waited at least an hour, but Hook didn’t have any intention of joining the semi-pro team and never showed up. I was disappointed at a missed opportunity to get introduced to Hook for business reasons, while James was disappointed simply because he missed out on meeting a basketball celebrity; James just had that innocent passion for anything basketball. Anyways, back to the task at hand. Do not underestimate how difficult it is to put a flyer on a windshield among seemingly endless rows of cars. We blanketed nearly the entire South lot. We had to duck a couple times from security. Some random guy was also wondering what we were doing darting around from car to car, but when he found out it was just harmless flyers, he was cool with it. After about a thousand cars (no kidding), we were exhausted and hadn’t had a bite to eat, so we took a break and got takeout at Jack-in-the-Crack. When we came back, we did some more and we’d only gotten through about one-third of the box of flyers! Then the game was ending. People started streaming out and I got in contact with Chris Sabbe, a buddy of mine who is one of the Warriors scorekeepers. He got us passes into the Warriors lounge by the locker room. You have to be 21 to get in, so I left James with a Dream League ball and a Sharpie in the lobby of the lounge and went in, looking to hand out more letters or invitations to players and VIPs for the Yao event. I had limited success. Mickael Pietrus and Rodney White were approachable, but another thing I learned was, our event wasn’t going to be attended by VIPs. You could see it on their faces, even through White’s sunglasses that he wears at night. Oh well, it was fun trying. James knew them by face. When I got back outside, James said he had gotten an autograph from every player! Well, it was the last game of the season, so I’m sure players were more willing to stick around and sign autographs, but I give James full credit. I honestly think players can relate to James. He had a way with people. James could even tell the difference between Zarko Cabarkapa and Andris Biedrins, the two 6’11” rookie Europeans who have since gradually become household names in the Bay Area. At that time during Warriors obscurity, I had no idea who these players relegated to the end of the bench were. Matter of fact, through process of elimination James had identified White as the one with whom I had spoken inside the lounge besides Pietrus. After that, we went back through the player’s tunnel and Pietrus drove by in his BMW, probably the last player to leave the Arena. “That’s Air France! That’s Air France!” James exclaimed to the mini-crowd surrounding Pietrus, who enjoyed the limelight and rolled down his window to shake a few hands. “That’s Air France, man,” James proclaimed to the group, pointing to the BMW as it sped off. I feel privileged to have witnessed James in his most unbridled display of love for all things basketball. After Pietrus drove off, we were spent, but James said it was the most fun he ever had. I’ll always cherish that night. I just wish James and I could have had the chance to do it one more time. I still really haven’t mourned yet, definitely not like I did for Vic. I don’t know what it is. I feel like I lost a fellow soldier. Like it was part of the calculated risk of going into battle. At the funeral, the pastor and others who spoke at the podium not surprisingly — and I can’t be in more agreement — said that James was a casualty of war. Of course, not the Iraq War. The war happening over here, no further than two miles away from your cushy neighborhood, there in the projects. Americans killing Americans. African-Americans killing African-Americans. Children age 12 to 18 killing children age 12 to 18. A good portion of the funeral was spent with the pastor pleading for an end to the violence, for guidance through church, and preaching to the young ones in the crowd not to be vengeful, not that any of James’s select friends would be. I never did find anything more than a CBS5.com paragraph identifying James as the deceased victim of a gunshot wound, sent to SF General that night (it took forever to Google it; I finally figured out the right search terms: “‘James Love’ Sunnydale“). To me, it’s like James paid the ultimate sacrifice just like many soldiers in Iraq. He becomes a statistic. He becomes proof that there’s strife, conflict, something that’s not working, something we’re trying to solve against what appears to be insurmountable odds. Futile? If you’re a firefighter battling blaze and wind in the Santa Ana mountains, do you stop trying to put out the fire? Well, I am now dedicated to giving purpose behind James’s life. He loved everything about basketball and he lived in constant life-threatening danger. Phil Nguyen gave James two $50 seats. We’ve all had similar fond memories of growing up. 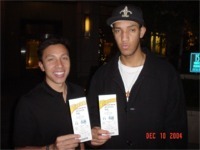 Here’s one of James getting 11th-hour tickets to a Warriors game. My buddy Phil Nguyen sent out an email about two $50 seats for the Orlando-Warriors game on the day of, which I was able to respond in time (thanks, Phil! ), knowing that James and Ibyn would somehow find a way to the game within an hour’s notice and Phil could use the donation as a tax write-off. I drove James all the way to the Arena to be met up later with Ibyn, just because I knew it made James real happy to go, even though both the Warriors and Magic were in the bottom third of the NBA standings. I remember telling James as we approached Phil’s pad to pickup the tickets, “Try to act as enthusiastically as you can. I know deep down you’re really happy about going, but show your appreciation to my buddy Phil. It’s not the time to act ‘hard’.” Wow, I was starting to sound like my mom! I wonder if that moment had any influence in him later expressing his gratitude to me the day before he died. Now here’s a profound fact: the Orlando game was on a Friday night with a 7:30pm tipoff, so I had to have picked James up from Sunnydale at around 6:30pm — the exact day and time of his altercation and death nearly one year later. James’s funeral service booklet says that Sunrise happened on November 18, 2005. So this is the beginning. Begin at the beginning. I’ve dated this article (written on 12/14) retroactive to December 4, which would have been James’s 19th birthday. It’s time to take action. Time to figure out a clearly defined to-do. James was Year 2005 homicide victim #87 in the City of San Francisco. The SF city government recently had Supervisor Sophie Maxwell lead a special committee called “Ending Gun and Gang Violence”. Alarming numbers were reported by the SFPD spokesman. If memory of the SFGOV cable broadcast of the committee serves me correct, of the 90 or so homicide victims in 2005, only 20% of the cases are closed because people living in the projects are too afraid for their lives if they agree to be a witness. 77% of those homicide victims were shot by a gun. 90% of them were male. On a bar graph, a majority of them were age 15-34. The murders were committed primarly between the hours of 6-8pm and 2-4am (the almost straight-line bar graph of which day of the week offers no clues, as Sundays are just as bad as Fridays). 64% of the homicide victims were African-Americans. Damn, I wish somehow James could have stayed over my house, or been doing stats, or somehow been at a Warriors game (they were away in Portland, though) that evening on Friday, November 18. 1. First, donate at least $1.34 (comes out to $1 after transaction fees) as explained above to James’s family, which needs to pay $6,300 for a plot for James’s casket. Thankfully, the funeral was paid for by a victim’s fund. 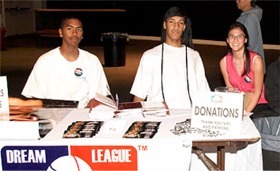 If we get all 500 Dream Leaguers in the Bay Area from last season to donate, that’s $500 right there. 2. Be aware of your surroundings. These are kids just like you and I were. They are kids living in a war zone. They’re just kids and probably less than 1% are “gangsters”. Just like in Iraq, the projects have “insurgents” too. Recognize. The war zone is probably no more than 2 miles from your doorstep. 3. Get to know these kids. Start by chatting with these kids when you play in Dream League games, much like how NBA players like to have a good time with the folks who keep score at the long table. Just jokingly ask them if they’re ready to tally 20 rebounds for you or something. Then you’ll be more inclined to volunteer some time in the near future. Dream League will start handling the infrastructure for mentoring. We’re planning to add some sort of program before and after each game, so that you can contribute to their lives on game days. Or help us out with corporate donations and matching. Anything. Be proactive and tell us what you can do for them. We’ll try our best to make it happen. But you know what? It’s really as easy as taking one of them to a Warriors game or a movie on a Friday or Saturday. How about just once per year? You’ll see what a difference just one day with a kid can make. CURRENT UPDATES — THANK YOU!!! Thank you to our donors, of which about $1,500 was raised within one week’s timespan, then another $1,200 was raised the week after that, then another $1,000 the week after that — YOU ARE ALL AMAZING PEOPLE!!! (email us if we inadvertently forgot to add you or if you wish to remain anonymous, although this list is primarily here so that the Love Family has a sense of identity with those who have been so kind to them): Anonymous, Manav Ahuja, Terrence August, Jason Bayani, Robert Blum, Jeremy Brady, Shuichi Bunden and Renee Chao, Vinson Chan, James Chang, Philip Chao, Rich Chew, Mark Chin, Pin Chou, Raffy Consing, Manish Dalal, Rob Dhat, Matt Dreschler, Drew Evangelista, Larry Fan, Matt Farrington, Mike Farrow, Gaddini family (Sofia/Devon/Kai/Simone), Doni Guitarte, Junius Ho, Jimmy Hom, Dave Hsia, Paul Hsu, Yong Hu, Marcus Hung, Quoc Hyunh, Ben Jahnke, Irfan Jamil, Usman Jamil, BJ Kang, Steven Kham, Henry Kiang, Jin Kim, Kirk Kim, Robby Kwok, Donald Lee, Jeremy Lee, Kevin “Fish” Lee, Jim Lender and Yo-ling Ma, Eric Liaw, Steve Lien, Tony Ling and the Chicago Dragons basketball team, Andre Liu, Victor Lo, Jensen Louie, Darwin Lui, Ray Lui, Sieu Ma (CEO of Starfish SF), Ma Family members not already mentioned, Kush Malhotra, Jeff Masuda, Ralph Morales, Wade Nakamura, Mark Newman, Henry Nghe, Rod Oquendo, David Ow, Eugene Park, Soo Park, Ariel and Anna Pilare, Rob Rius, Mark Scates, Senturia family (Emily/Pauline/Michael), Jerry Shih (CEO of AMAX Corp.), Mike Siv, Ken So, Akshat Tewary, Ramon Tioseco, Nguyen Tran, Thuan Tran, Ben Trevino, Bor-long Twu, Rose-Marie Twu, Twu family (Chloe/Stephanie/Rich), Visitacion Valley Community Beacon, Ken Wan, Irene Wong, Jones Wu and the East Bay Cardinals, Rich Wu, Jason Yee, and a great many more who have expressed their sympathy and prayers.